The thought of a relaxing vacation at a luxury beach resort tempts us all to hop on a plane and unwind by the pool, margarita in hand, right? Right. So let me inform you that Belize has countless beautiful clear water beaches and colorful bars to help you accomplish this paradise fantasy. While laying around all day in Belize is very relaxing, it can become very boring after a short while, and a much better time awaits you in Belize if you’re willing to leave your comfort zone and try something a little more rustic and adventurous. Snorkel or dive some of the most colorful reefs in the world, hike through dense rain forest in search of jaguars and monkeys, or visit some ancient Mayan ruins; the outdoor fun really doesn’t end in Belize! In late November last year, we opted to stay on the mainland in a tiny village called Hopkins, and it was the best choice we could have made, for so many reasons. Hopkins is a Garifuna colony, so we enjoyed experiencing Garifuna dance and song, and eating their delicious cuisine; their culture is unlike any other, and we wouldn’t have been so immersed in it if we’d stayed in San Pedro (Ambergris Caye). Hopkins is situated between the Maya Mountains, the Caribbean Sea (boasting many different cayes close by, which you can easily visit during your stay), and plenty of wildlife parks. There is plenty to do in and around Hopkins, including visiting the vibrant bars and restaurants in town, which deliver genuine hospitality and mouthwatering food. Where to visit in Belize? I’m not saying that you won’t have a good time lounging around Caye Caulker or Ambergris Caye; you’ll undoubtedly enjoy yourself thoroughly. I am saying, however, that those are some of the most touristy and common places in all of Belize to visit, so perhaps, if you’re like me, an adventurer and a thrillseeker, you should consider creating your own authentic Belizean memories elsewhere. If you do this, you will definitely be in for a much more memorable, stimulating, and culture-comprehensive trip. 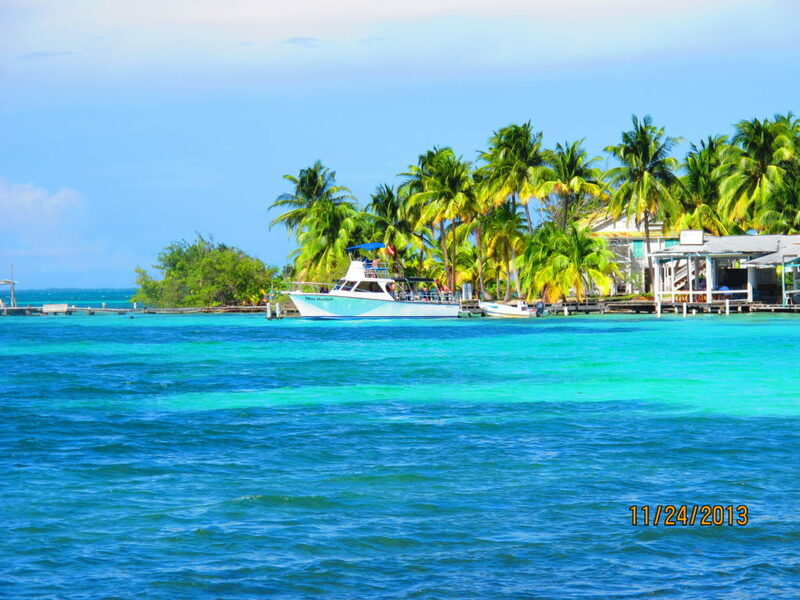 You could also consider experiencing the best of both Belizes: visit the cayes and the mainland during your trip. If you like to relax and also adventure, this is probably the best way to experience Belize. When I hear the name Belize, I think of pure nature. I imagine deep and varied shades of blue, bright and intense greens. In a land so uncivilized and untamed, natural color takes over everything and overwhelms your every sight. And where such nature exists, adventure beckons. 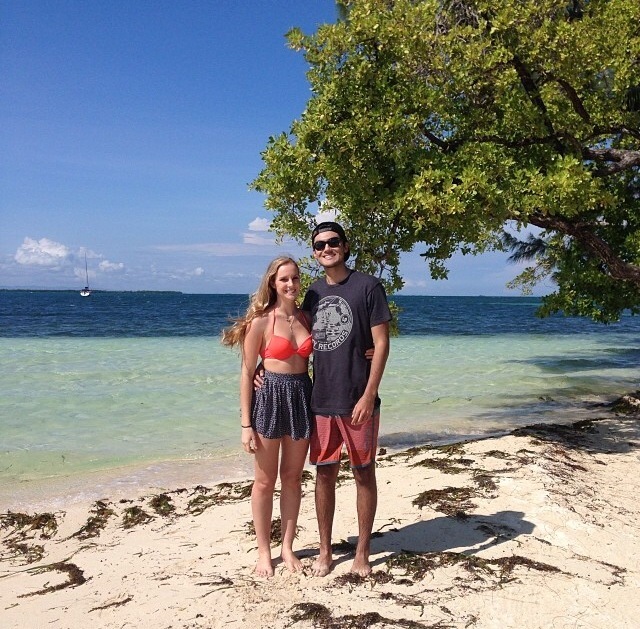 We had the most beautiful, fun-filled week in Belize and we would jump at a chance to return. I can just picture myself back on that bright blue kayak with Mauricio, trying to convince him to let us kayak where the caiman dwell. Since we’re still alive, you can probably guess that he got his way; we stayed in the boring caiman-free zone. Sigh. I would love to be back on that tiny fishing boat with a local Garifuna man named Patrick, hooking a barracuda, which we ate for dinner that night. 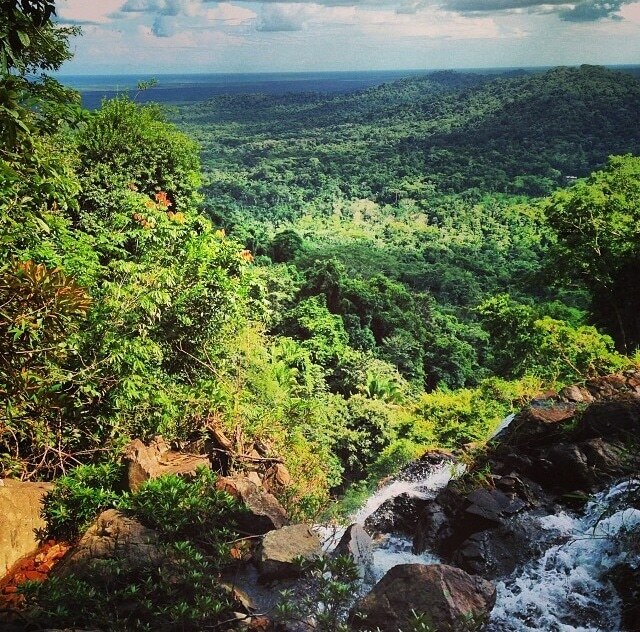 What’s to love about Hopkins, Belize? As you can already tell, there are so many reasons why we loved our stay in Hopkins! So if you’re still interested, let me tell you a little more about what we did during our week in Belize. We rented a beautiful beach house in Hopkins for our entire stay, which was the perfect base to explore the rest of the country. The giant two-story house sat right on the sand and offered all the amenities we could have imagined. The homeowners stocked the property with bikes, kayaks, snorkel gear, and fishing poles so we could properly experience Belize. In general, I think renting an apartment or house, in comparison to staying at a hotel or hostel, is the best way to really get to know an area, and can sometimes be the more economical option too. But the choice you make should always depend on the place you visit; specific accommodations work for some places and not for others. In case you’re interested, to find my vacations rentals, I use VRBO. But I’m going off on a tangent, so back to it! Hiking through the jungle looking for tapirs, birds, monkeys, etc. is a must while in Belize; the big cats and snakes aren’t even the scary part! I’m pretty sure that if trails this intense existed in the States, people wouldn’t be allowed to hike them without signing a waiver. These hiking trails were so steep and sketchy that at some points we were clinging onto so-called “safety ropes” for dear life, meanwhile scaling cliffs. And I kid you not; Death was staring up at us from the trenches below. I’m not exaggerating! Or maybe I am, but only a little bit. I’ll just say that if I never work out, and I could do it, then you certainly can too. Just don’t look down! These crazy hikes to the tippity tops of mountain peaks rewarded us with some unforgettable memories and some of my favorite photos ever. 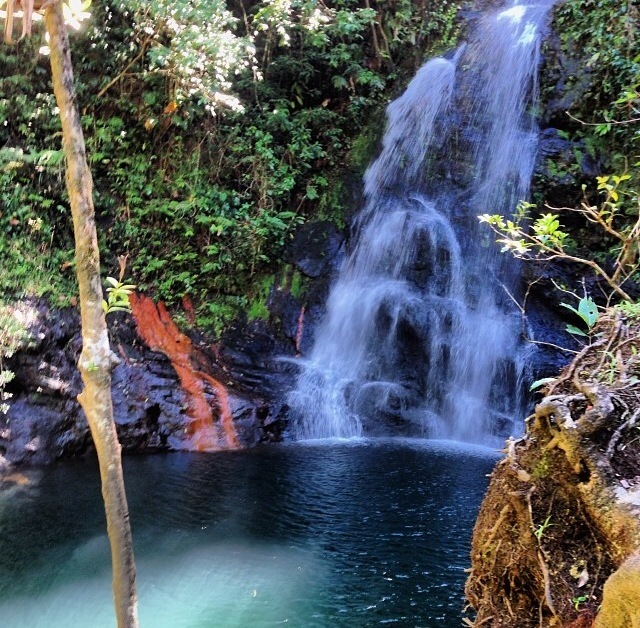 Moral of this story: Embark on these crazy nature hikes and you will be rewarded! 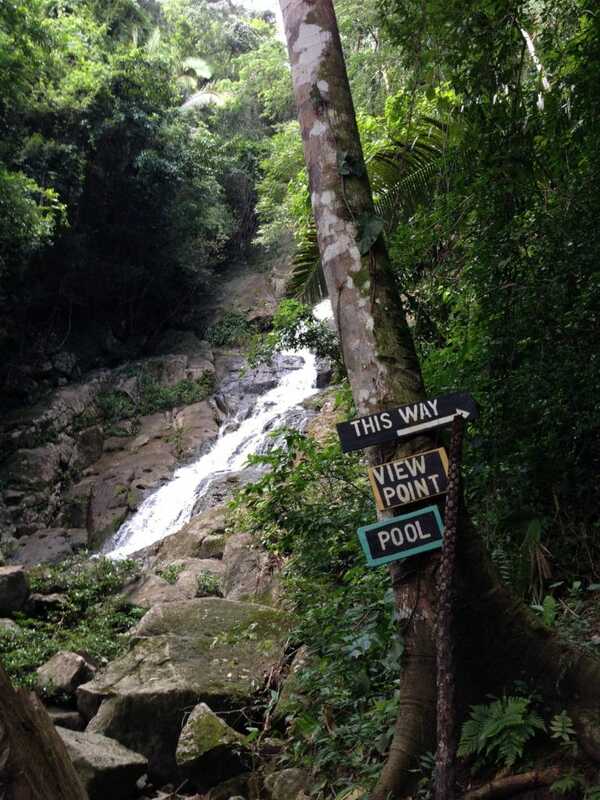 At the first place we hiked, Mayflower Bocawina National Reserve (22 kilometers away from Hopkins), we headed up Antelope Trail in search of Antelope Falls, and the most amazing viewpoint, at which we were overtaken by a sweeping panorama of the thick, leafy rainforest. Antelope Falls is one of the many waterfalls we encountered during this hike, but it was by far the most spectacular, especially because of the swimming hole where we took our famous kissing picture! This water was so clear and it was the perfect temperature: the ultimate refresher after such a hard hike up there. And even though drinking random water isn’t always the best idea, and some people argue that all water tastes the same, we discovered that this water was so crisp and fresh; it tasted amazing. I wish all of my drinking water came from that swimming hole, without any people actually ever swimming in it. But on that subject, the only other person we saw in the entire national reserve was the park ranger when we first arrived! When you come to Mayflower Bocawina, you will find nature, and more nature, and zero disturbances from the modern world, which I think is pretty grand. If you’re feeling super adventurous, and maybe a little stupid, instead of hiking the trail back down, ropes plummet to the bottom of the mountain in case you would enjoy rock climbing down slippery rocks without a harness or a guide! Have fun with that one and I’ll stick to the trail! The next place we went to hike is called Cockscomb Basin Wildlife Sanctuary. This park is a known as the world’s first jaguar preserve, which protects all of the jaguars and other animals that prowl the vast green area. If you would like to see jaguars, exotic birds, howler monkeys, deadly snakes, and more, here is my tip for you: Along with a little luck, arrive at the preserve very early in the morning and take to the trails very quietly with your eyes peeled; you are way more likely to see wildlife under these conditions, as the animals come out in the morning to hunt, and they know to hide from humans later in the day. Don’t be disappointed if you don’t see much wildlife, the protected area ranges thousands of acres, so the animals could be anywhere. 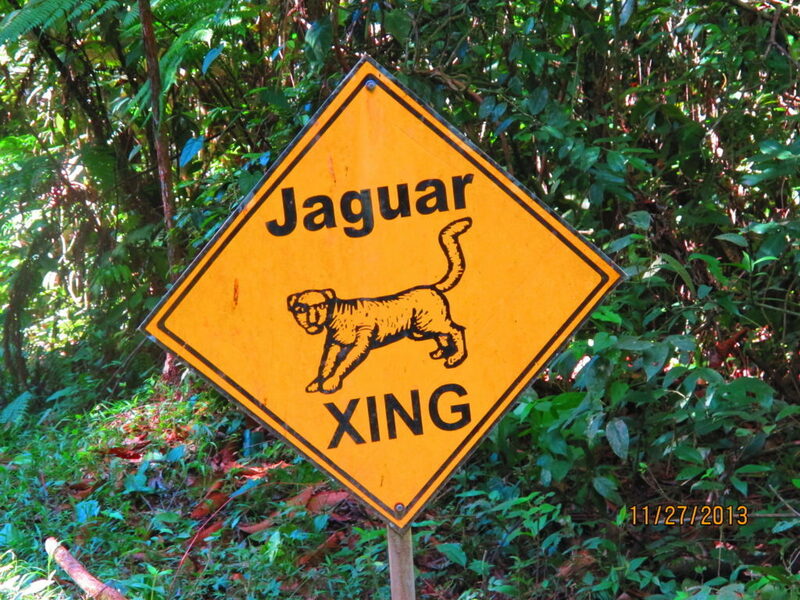 Enjoy the jungle, and if a jaguar happens to bless you with his or her presence, your experience at Cockscomb Basin will be even more exciting! Make sure to have your camera at the ready! One of my favorite travel days ever was the day we fished and snorkeled in Belize, and we also visited a few cayes to relax for a bit. As I mentioned before, we met a local named Patrick who took us out on his boat for an amazing adventure at sea. First we boated out to a caye to catch sardines for bait. Then we trolled around the cayes for a while and we successfully caught snapper, triggerfish, and barracuda; and I gotta add, I caught the biggest fish! I’m the winner! Next Patrick boated us to Bread and Butter Caye to have a Garifuna style picnic and enjoy the beautiful beach. The cayes off of Hopkins’s coast have some of the nicest clear water, white sand beaches you’ll probably ever experience, so I highly recommend checking them out! And I highly recommend Patrick too, if you can track him down. Just ask anyone in the marina where you can find Patrick, because in Hopkins, everyone knows everyone. I’m so sad that we didn’t have an underwater camera with us for the next part, to document my favorite activity of the day: snorkeling. The Mesoamerican Barrier Reef in the Caribbean Sea stretches over 940 kilometers long and takes fourth place for the largest coral reef in the world. Since the Mesoamerican Barrier Reef is so extensive, you can imagine that it teems with vibrant coral and exotic marine life. This was by far the best snorkeling I’ve ever experienced, and it definitely inspired me to get scuba certified (which hasn’t happened yet – but soon, people!)! We saw all kinds of marine life, including rainbow parrotfish, seahorses, stingrays, sea turtles, lobsters – you name it, we saw it. This goes back to my speech about how Belize bursts with color and nature; this reef’s beauty will utterly blow your mind. Our day at sea exhausted us, so we stayed in the house that night and the house caretaker, Nicolosa, cooked us a delicious Belizean meal, which included the barracuda I caught that day. We experienced so many more amazing things in Belize, but here’s the last notable one that can easily be replicated when you visit. On my birthday, (which is coming up on November 29th by the way! ), we decided to drive westward to the Guatemala border, to visit Xunantunich (pronounced like shoo-non-toon-itch), which is a wondrous ancient Mayan archaeological site that you should definitely visit during your stay. We should have too, but we were stopped upon arrival by police and were told we couldn’t enter the site. We drove all the way from Hopkins to San Ignacio (a two hours drive) to find out that we couldn’t take the ferry across the Mopan River to the ruins because the water was too high from the recent rainy season. It’s not like the typical people in Belize regularly update their websites – if they even have websites – so we had no way of knowing until we got there. Plus, my Lonely Planet book didn’t say anything about it! So here I am, telling you, don’t go to Xunantunich right after Belize’s wet season. That news really bummed me out, especially since I spent my entire birthday in a car, all for nothing. But it wasn’t all for nothing, because there’s always a positive side, right? Yes! Luckily, we found out that another ancient Mayan site, Cahal Pech, was nearby. It wasn’t as spectacular as Xunantunich would have been, but it was still a sight to see. We drove down the road about 20 minutes and explored the 7 plazas and 30 structures that the Mayans left behind. Amazingly, archaeologists claim that during the Late Classic period, 10,000 – 20,000 Mayans lived at Cahal Pech. 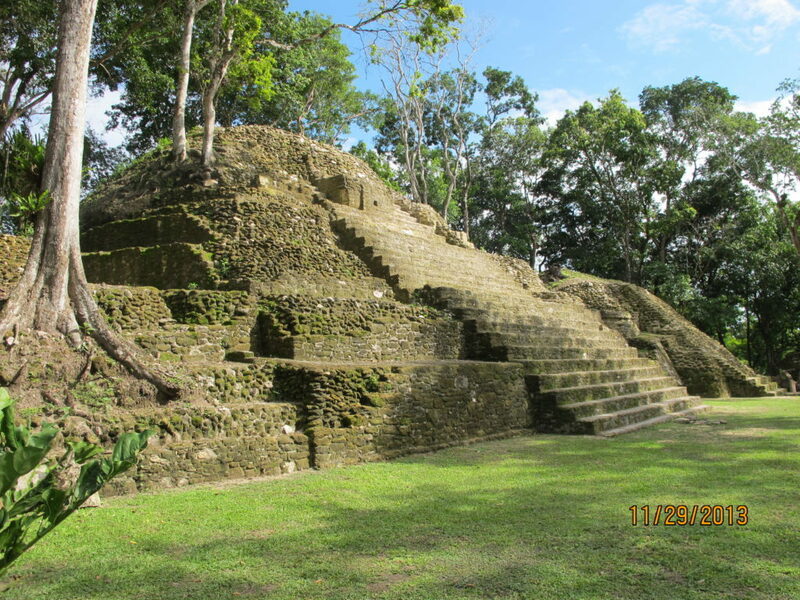 Make sure to check out one of the ancient Mayan ruin sites, as Belize’s richest history lies with the ancient Mayans. Since everything can’t always be rainbows and butterflies, even in a place so naturally beautiful as Belize, I’ll let you in on the main downsides of Belize that we experienced; however, there weren’t many! Most of Belize is under-industrialized (partly because it hasn’t been such a popular tourist destination until very recently) so a few problems we faced were due to this fact. 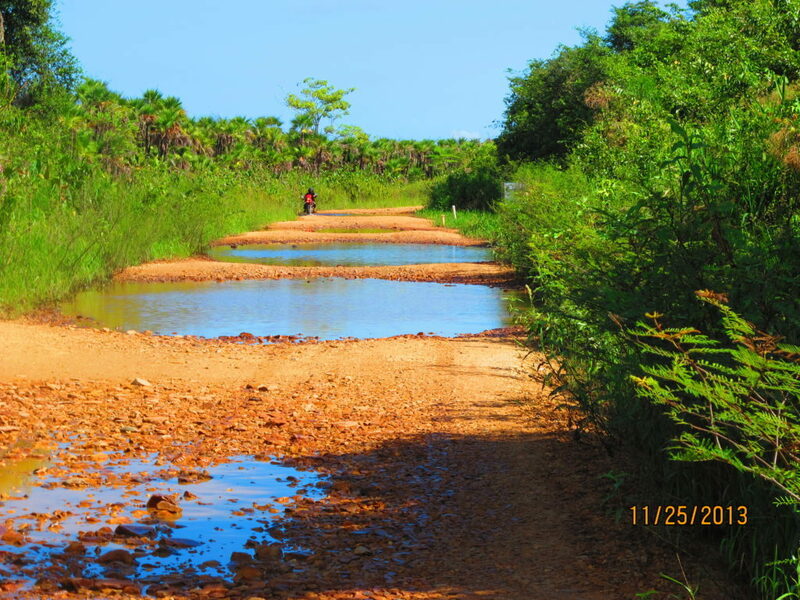 Hummingbird Highway, which is one of the main highways in Belize, is paved; however, as soon as you exit, you’ll be on dirt roads for what will likely be the duration of your drive. This doesn’t seem like such a huge problem until you realize that you’ll be driving about 15 k/h because of all of the giant potholes that may even be filled with water depending on the season. So basically, you could be driving at snail pace through miniature lakes for what could be hours. But it’s okay, because whatever your destination is will probably be worth the dreaded drive. We also received major bug bites in Belize. Well actually, I’ll rephrase that. The gnats ate Mauricio alive, and they kindly spared me. The poor guy procured 117 bug bites on our count, and I less than 10. I take allergy medicine every day because I’m allergic to dust, so the bugs don’t like me, which is pretty awesome. So my advice is take some allergy pills with you, because the bugs won’t like you much either, and also antihistamines will calm your itchiness! We encountered so many bugs because of all the water that collected during the rainy season (June to October), causing mosquitoes and all kinds of unpleasant insects to stick around well into November. Friends of ours visited Belize in March and returned home with no bug bites at all, so my advice to you would be to wait until at least December, or face the reality of non-stop itching, and later scarring from so much scratching. I hate to end on a bad note; those things can be avoided so easily if you just choose the right time of year to visit Belize. Belize’s high season runs roughly from November to May, so any time within these months you will likely experience perfect beach weather and the bugs’ presence should be at a minimum. While November enjoys amazing weather, as I stated, the effects of the rainy season still haven’t dried up and gone away, so beware! After a trying morning of nature hiking, spending an afternoon on a beautiful beach in Belize, sipping a Belikan beer and soaking up the sun sounds more than great. Take my word for it; Belize perfectly balances nature, adventure, and relaxation and there’s no way you’ll ever want to leave this paradise. Nice blog! I am ecstatic to see you had tons of fun in my country. Hopkins is amazing especially in November when Belize celebrates Garifuna Settlement Day. Nice pics and good advice for other readers. Keep enjoying the world guys! p.s. We hope to have you in Belize some time soon again! Thanks, Leeah! We LOVED Belize. Hoping to come back someday soon… We were actually in Belize in November but just missed Garifuna Day! We still were able to witness the traditional dance with drums anyway because everyone was still celebrating!